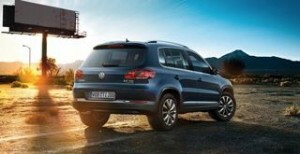 The Volkswagen Tiguan is a two and four wheel drive SUV and is a rival to the Audi Q3 and BMW X1 sitting slightly above the Ford Kuga and Nissan Qashqai, the name comes from a competition winner in a German magazine and is a mash-up of tiger and iguana (dispels the myth that they don’t have a sense of humor), however the name is the only thing not to like about the car, the safe styling aside. The Tiguan sits on the same platform as the Golf Plus, the previous Golf and the Touran, so you are getting tried and tested technology and even with the added ride height the Tiguan handles well and as you would expect soaks up the bumps with ease. Comfort is a big plus with the Tiguan for both driver and passengers, the rear seats slide and recline meaning you can add to the class leading 470 litre boot if required. 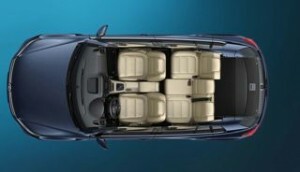 The Tiguan is available in either ‘S’, ‘Match’ or R-Line versions, while the ‘S’ is a little sparse on gadgets it does come with air conditioning, 16″ Alloy wheels, ESC (Electronic Stability Control), Multifunction computer, DAB radio/ CD player with 8 speakers and all round electric windows, the Match trim adds equipment that should be standard car such as Bluetooth and climate control, also added to the ‘Match’ are 17″ alloy wheels, a multifunction leather trimmed steering wheel, Park assist (the car identifies parking spaces and parks the car for you -very clever), front and rear parking sensors and a 5″ touchscreen CD / DAB radio with integrated Sat Nav. The 4 wheel drive R-Line has 18″ alloys Bi Xeon lights sports seats and the option to pair a 210 bhp petrol engine that can hit 62 in 7.8 seconds, the economy does dip to 33.2 mpg. The smart engine choice is the 150bhp or 180 two litre diesel which is available in two or four wheel drive (badged 4Motion) paired to a 6 speed manual or a 7 speed Dual Clutch Automatic gearbox, acceleration for the 150 in 2 or 4 wheel drive is an excellent 9.8 seconds from standing to 62 miles per hour and the power delivery is smooth through the gears. Fuel consumption is also excellent as in two wheel drive guise the Tiguan has a claimed return of 57 miles per gallon and even with four wheel drive can achieve 50 mpg. If you need a tow car the braked weight the Tiguan can handle in 4 wheel drive is a massive 2200kg (2000kg in 2 wheel drive), taking the 85% rule into consideration it means you can tow almost anything from a horse box to a twin axle caravan.